It’s like a breath of fresh air. Out of tragedy comes a tribute to the victims of the Boston Marathon bombing. After what could only be described as an emotional week, because of the government shutdown, isn’t it nice to see our country pull together and act united?! The way it is meant to be. The way it should be. 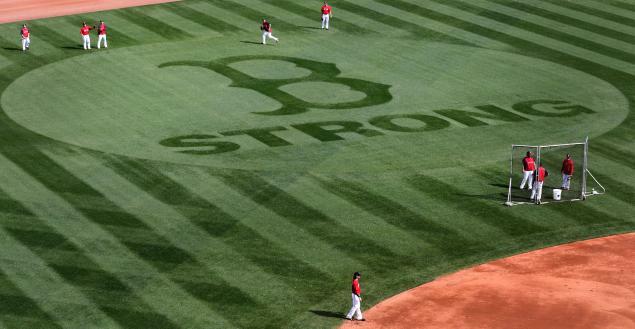 The Boston Red Sox honor victims and first responders of the Boston Marathon bombing with emotional pregame tribute. It has been 173 days since the bombings shook this city and the Red Sox have kept the victims close to their hearts every day. ‘B Strong’ patches are sewn on their jerseys, while the same stickers adorn the walls of virtually every locker inside the clubhouse.